More than half of U.S. states have established Renewable Portfolio Standards (RPS) requiring electric utilities to generate a certain percentage of their electricity from renewable sources. These mandates raise energy costs by forcing households and businesses to use more wind and solar energy, which are more expensive and less reliable than traditional energy sources like nuclear, natural gas, coal, and hydro. Faced with these facts, some states are considering repealing or reforming their RPS mandates. The National Renewable Energy Laboratory (NREL) and Lawrence Berkeley Laboratory, however, are trying their best to build the case for the states to keep their RPSs with a recent survey. But as a new study from the Reason Foundation shows, the NREL and Lawrence Berkley Laboratory survey is fatally flawed. Indeed, RPS mandates make energy more expensive for American families. As the Institute for Energy Research explains in testimony submitted to the Kansas State Senate, RPSs force states to replace their most affordable, abundant energy sources (nuclear, natural gas, coal) with more expensive, unreliable sources (wind and solar). The following chart compares the costs of installing and using various types of energy sources. 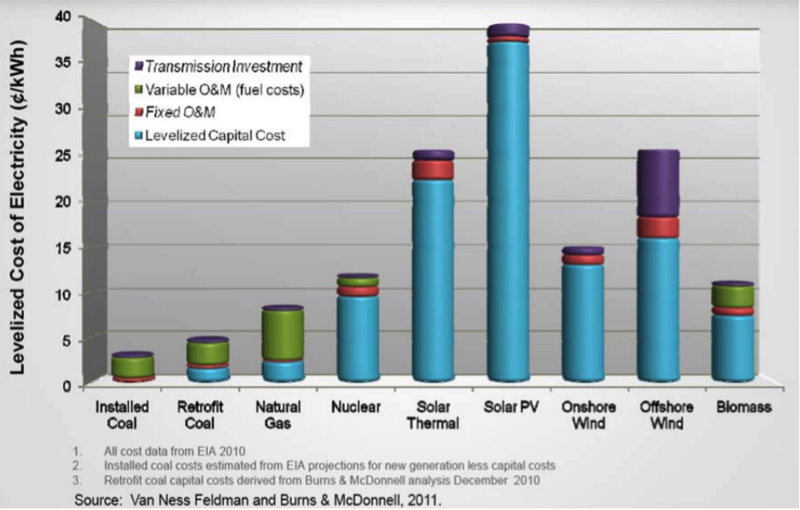 As you can see, wind and solar are both significantly more expensive than nuclear, natural gas, and coal. These figures are not an academic exercise—they have real-world impacts on electricity prices. States that use the most affordable energy sources also tend to have the lowest energy prices. 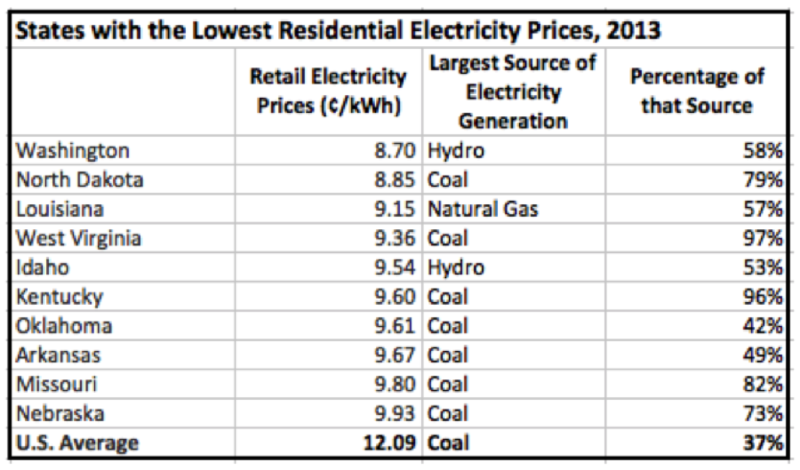 As the following chart illustrates, coal generates the largest share of electricity in seven out of the top 10 states with the lowest retail electricity prices. The other three states use primarily natural gas and hydro. And only three out of the 10 states with the lowest electricity rates have RPS mandates (a few set voluntary goals). Lawmakers who are considering repealing or reforming their state RPS mandates should not let the flawed NREL study give them cold feet. Renewables are more expensive and less reliable than traditional energy sources. That means any state laws mandating or subsidizing renewables tend to result in more expensive energy costs in that state. These costs will only increase as RPS mandates increase. If people want to see lower prices, getting rid of RPS mandates is a good place to start.